1. Who is making the music? 2. Who listens to the music? 3. What is the musical system? 4. How is the music performed? 5. What is a musical artifact? As we explore the nature of music, it is important to consider the objects that make the sounds: musical instruments. 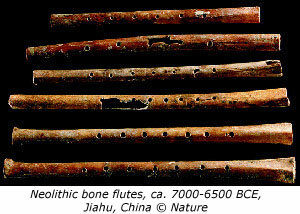 The use of musical instruments, such as clay flutes and bone whistles, has been traced back to the earliest documented historical period in China (Shang dynasty, 1765-1121 BCE). Instruments have since taken hundreds of thousands of forms and shapes. In the case of China (and in pre-Columbian civilizations as well), the discovery of ancient instruments such as ocarinas, or vessel flutes, are evidence of a sophisticated musical culture that thrived thousands of years before Europeans composed symphonies and operas. In addition to serving as musical documents, instruments and the substances from which they are made have much to tell us about the landscape, natural resources, and the culture of the people who make them. For example, rainforest peoples of Africa and Brazil hand-carve panpipes and xylophones from wood, reflecting their special relationship with the natural environment. In America at midcentury, factories produced elaborately decorated accordions sporting bright colors and intricate grillwork. These tell us much about a postwar preoccupation with technological innovation, not to mention Americas love affair with molded plastics. Musical instruments also have a great deal of social and symbolic meaning within their communities. In the folk religion of Haiti (vodoun), certain kinds of gourd rattles are associated with spirits and are used to evoke them in religious ceremonies. Ethnomusicologists have given a great deal of thought to describing and classifying the huge range of musical instruments. The Sachs-Hornbostel system divides instruments into five categories based on how sound is produced. For example, rattles belong to the category of idiophone, a self-sounding instrument. Accordions are aerophones because they make use of vibrating air. And Casio keyboards are kinds of electrophones. As you explore music from different cultures, however, ask questions about how local people describe, classify, and name their instruments. Why do some jazz musicians refer to their saxophones and trumpets as my ax? Can instruments (and voices) be tools or even weapons that give their players a way of expressing hidden or suppressed ideas and powers? Voices produce their own distinct sets of sounds. Each society has its own notion of what a beautiful or good voice is. Paying attention to these notions can reveal puzzling complexities and inconsistencies within a culture. Often we hear similarities in some traditions between vocal and instrumental production. Particularly fascinating are those traditions that imitate instrumental sounds through song, as in the drum syllables (vocal sounds such as din, din, da) with which Indian performers duplicate the special sounds of the tabla (frame drums). Almost every musical sound has been preserved on recordings in some form. Since the development of the phonograph in the early 20th century, recordings have joined the teacher, guru, or musical expert as key transmitters of music. The role of the recording in transmitting music has been particularly important where traditional music suffered a period of decline. A recording is one way that music can be preserved and transmitted in a durable, accessible form. As you learn about musical systems, look for other ways that people have tried to transmit music. In Europe, illuminated manuscripts were treasured and costly possessions, as much works of art as musical documents. In analyzing processes of transmission, we need to be alert to the limitations of any mechanical or electronic means of transmitting music. Vinyl and the magnetic digital chip both have limitations. A recording, regardless of its sound quality, is only a document of a musical work as it was heard at one moment in its history (music scholars compare many recordings before they make comments on a particular musical sound or style). Comparing a variety of sources and documents is the best way to get a handle on any musical system.